My last post explained a bit of how my parents have moved to a new home and are getting settled here in Santa Barbara. My dad’s ultimate goal is a garden and chickens (coming soon! ), but along the way he’s had many other interesting thoughts and hopes–and some have come to fruition, and others, like the outdoor oven I was telepathically rooting for, have not. But, he did purchase a Big Green Egg. If you haven’t encountered one of these round, fuel efficient, space-age-looking barbecues, then, well, maybe you will? 🙂 I have a brother-in-law who loves his–and makes pizza, and cooks turkeys, and bakes lasagnas and all sorts of other kooky things… But cooking on this type of barbecue is all new for me and my dad. We were curious how a loaf of bread would bake in the egg. Would it act like my cast iron pots, would it bake like a wood-fired pizza oven, would it mimic an earthen oven? So we put it to the test one gorgeous, Santa Barbara afternoon. We opened the lid too many times to check on things. The heat was easy to control by fiddling with the vents and we were basically able to bake between 500 and 400 degrees for the full 40 minutes. 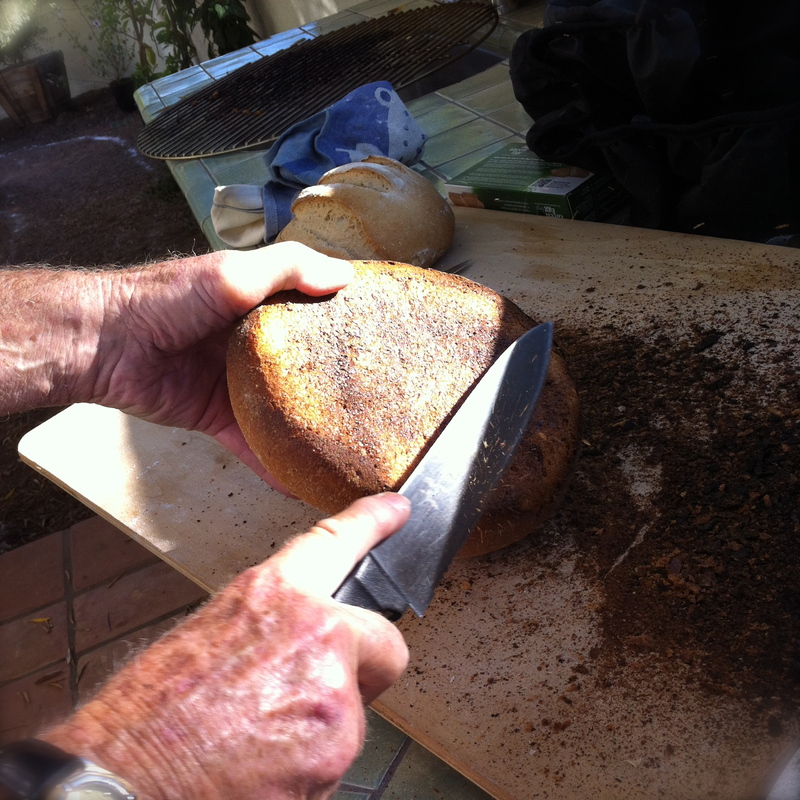 The surface of the heating stone gets too hot and burns the bottom of the loaves. Will need to fix that–will ask Brother-In-Law!!! Had to scrape away quite a layer of char on the bottom. The heat in the egg seems to be quite dry–will add a can of water for steam next time. Because we burned the bottom of the bread, we decided not to grace the neighbors with the second loaf. We WILL try again and certainly do some sharing. What about you? 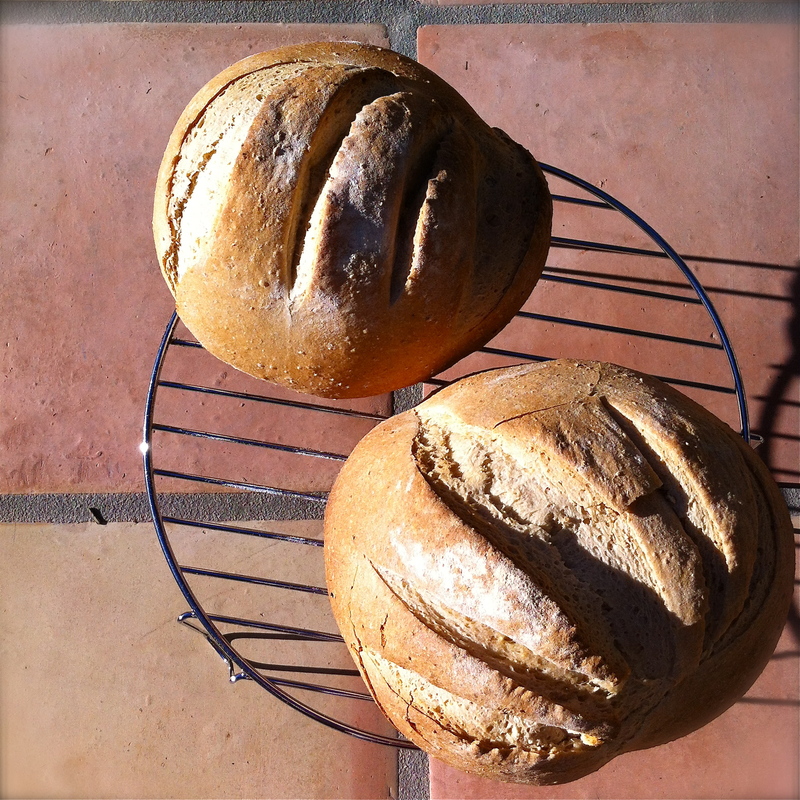 Have you had success baking in an outdoor setting? I’d love to hear your stories of adventurous baking. This entry was posted in On Baking and tagged baking on a barbecue, baking outdoors, barbecue baking, bbq baking, Big Green Egg, Green Egg, Green Egg baking, outdoor oven by janegmeyer. Bookmark the permalink. what a fab invention! never seen one before. might have to check into that one. we love bbq-ing ’round here. That is fascinating. I have never tried anything like that. I hope it works well the next time you try it out. The bread looks great from here. Bummer the bottom burner. 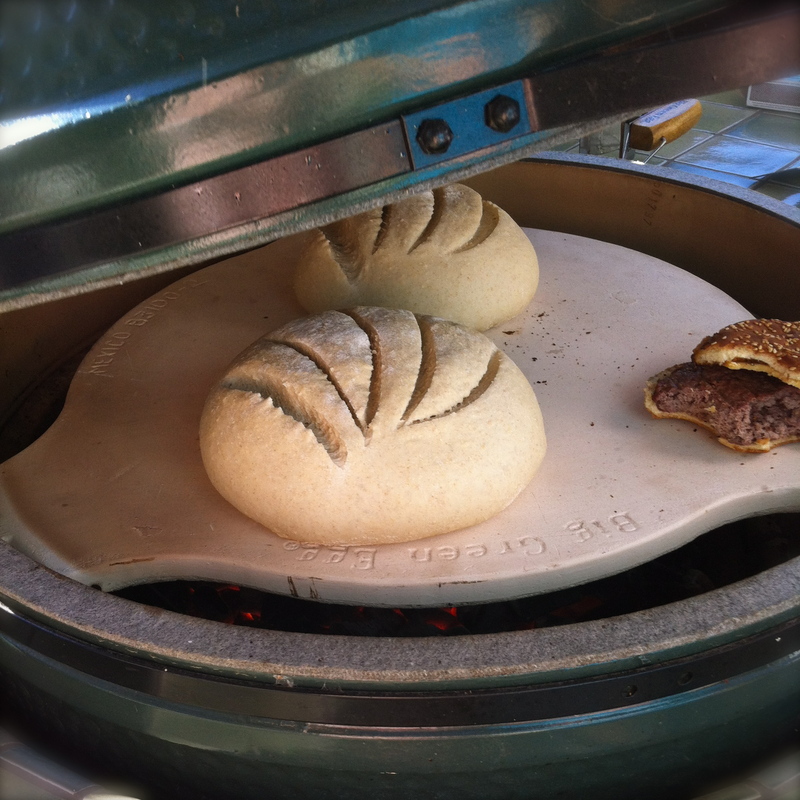 I haven’t done much bread, but for pizzas and calzones and other bread like items, we usually use the BGE pizza stone and get some kind of spacers to elevate it up off the plate setter so air will flow underneath and the bottom won’t burn. So is your dad using that gas grill much since he got the egg? We ended up giving ours away. Our old grill was a gas grill. The one we currently have has a gas starter and then we shut it off and use cowboy charcoal, it gives such a great flavor to the food, and I feel better about not having propane touch the food we’re going to eat. I look forward to hearing about and seeing pictures of the chickens! Our 3 girls are doing well and I was just talking to my husband about getting another one (in urban places, like where we live, we are allowed to have 4 hens, no roosters). 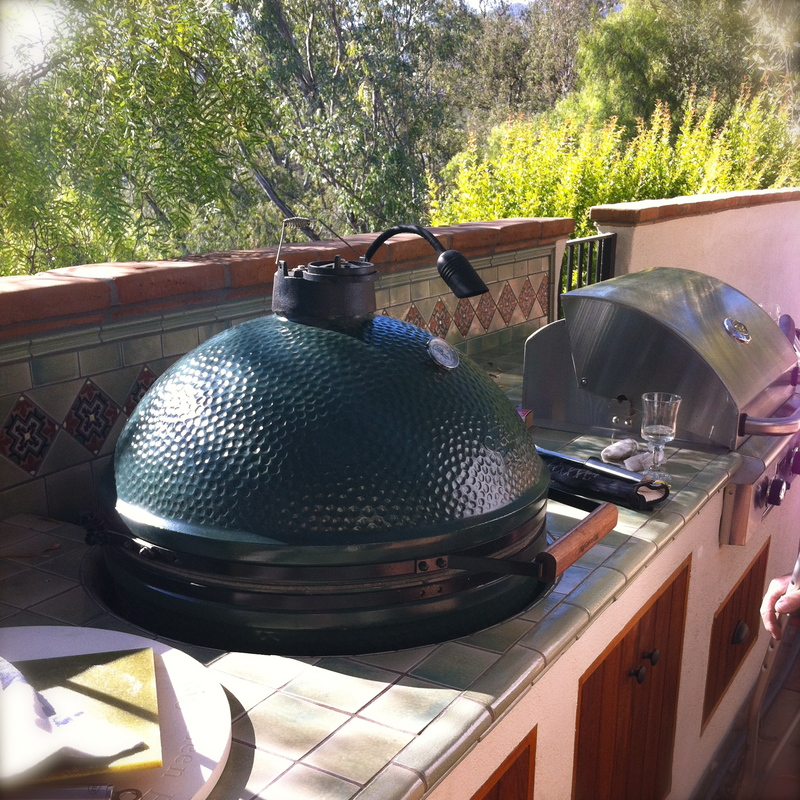 ♥ And I’ve read a lot about the green egg!!! My husband grilled 70 shrimp skewers this weekend for lunch at church. They were so good. I wanted to get him a green egg because he also loves to smoke meat. I have made pizza with fresh yeasty dough on a stone in the grill before, but never any other kind of bread. My thoughts are that in a regular wood oven there is no fire underneath the bread. The fire has been removed and it’s just the heat. With the egg the heat comes from both the convection current circulating in the BBQ and also direct heat from the still burning coals underneath. Perhaps placing firebricks on the pizza stone would offer the right protection to the bottom. I just purchased a green egg last month and have only just started experimenting with it so I’d love to know if you tried again.